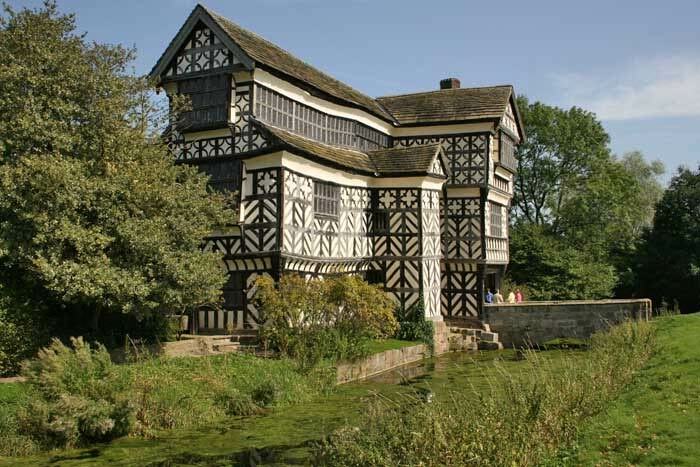 Situated near Congleton about an hours drive from Christleton, Little Moreton Hall is one of the most magnificent timber framed buildings in the country. Built in 1504 for the Moreton Family, it is surrounded by 1,300 acres of farmland, a delightful rural setting. Oaks provided the material for the timber framing, which was erected on a stone base using a system of pegs and studs. Oak laths and daub, a mixture of sand, clay, straw and cow dung was used to fill the spaces in between the main oak frame. There are some beautiful patterns created in the wooden frame, and lime wash was added to the daub to give the house its distinctive (black & white) look. The roofs and chimneys are also interesting features, bringing huge slates and colourful bricks to help control both rainwater and fires respectively. The chimneys are on the outside of the structure to prevent fire damage, and each serves several fireplaces at different levels in the house. The main roof at Little Moreton covers the long gallery, and over the 500years or so, has pushed down on the whole structure, causing some twisting in the floors and frame. The National Trust who now own the building has recently successfully inserted a steel frame under the main structure to prevent further damage. The famous long gallery completed in 1562 early in the reign of Queen Elizabeth I is a fine feature of this house, where walking in wet weather, dancing or other entertainments took place. Elizabethans loved fine clothes, and this was a great place to show off the fashions of the day. Children could also play here away from the gaze of the adults in the house below. Skittles was one such game. This gallery like the house also had another great status symbol of the day, leaded windows. Small pieces of shaped glass held together by lead, completely filling the larger window frames. There are many other fine features at Little Moreton including a Great Hall, Chapel, Parlour and Withdrawing rooms, but it is small enough to see a family living there very comfortably. The house is also surrounded by a moat where fish were bred, and there is a delightful knot garden behind the house. Little Moreton is worth a visit at anytime*, but look out for the special events, including medieval fair days, when actors dress up in costumes of the period and display the way of life, food, games, customs etc. that existed during Elizabethan times. *Check with the National Trust for dates and times of opening.